King Ghidora (aka Ghidora or KG) has done really well in multiple show venues. He was awarded Saikoshou and Reserve Supreme from NIPPO-USA, becoming the first NIPPO-USA Champion Meiyoshou Japanese Akita. Ghidora earned his Championship from UKC and became the second Grand Champion in the breed ever. He was also #4 in UKC Top Ten for 2014 with an impressive lead over the other Japanese Akita in the Top Ten. We’ve always said that King Ghidora is our “breed ambassador” because he loves everyone he meets. We take him to conformation shows, pet expos, cross-country trips, and public events where he is happy to schmooze and put on the charm. He is a laid back, mellow, low energy dog that knows how to “go with the flow.” We have been very happy with the low key temperaments and high confidence in his puppies from Litter B and Litter C.
The puppies from King Ghidora’s first two litters have all grown up now. His daughter, Gamera, became the very first Grand Champion in the breed last year. His son, Bruno, earned his CGC title around the same time. Gamera and Bruno have been getting their health clearances done this year and passed all of them. 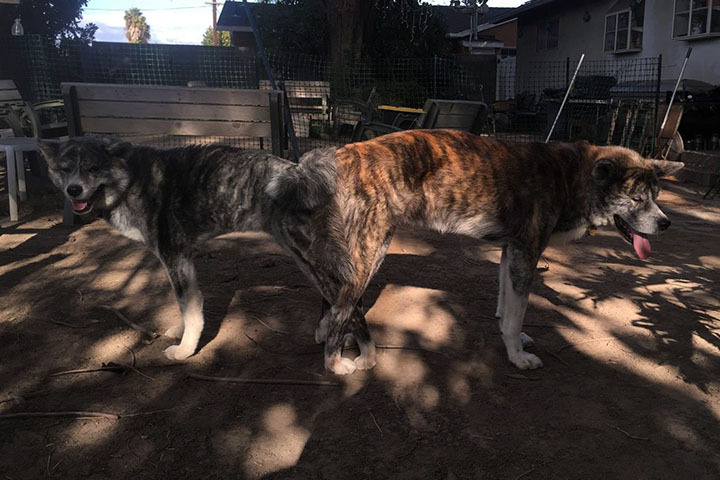 Both are gorgeous, well-adjusted and healthy young dogs, as are their other siblings. We look forward to more of the same from Ghidora for Litter D.